And the following day, the talented left-hander moved up to second place on the Cuestars Under-21 Gold Tour after winning his second final of the season. 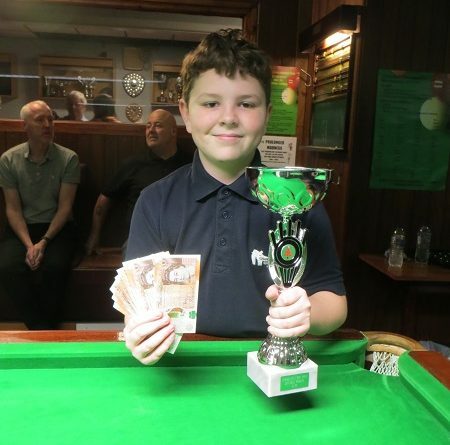 On Saturday, he cleared the table for a monster 121 break against Riley Ellis in the Eastleigh & District Under-19 League at Chandlers Ford Snooker Club. His dad, Dean, watched every shot and mum, Claire, dashed over to the window between the bar and the snooker room to see the last few balls potted. Sykes, who has hit three figures a couple of times in practice matches, made his first 90+ break in competition in August, 2017, at the age of 11. Back at his home club the next day for the fifth leg of the Cuestars Gold Tour, he overcame clubmate Steven Hughes 3-1 in the final to pocket £100 prize money. Both semi-finals went to fifth-frame deciders. Elliott Weston (Portsmouth) compiled a 64 break in a 3-2 defeat by England international Sykes and Ronnie Sullivan (London) made a 72 in his 3-2 defeat by Hughes. Earlier, Sykes lost his first match 2-0 to clubmate Riccardo Drayton but three subsequent victories helped him win the group. “I got off to a rusty start,” he said. “But then I managed to play well and stick in there. “I couldn’t really pot a ball in the group stages and then I just about scraped through against Elliott. Bradley Cowdroy, who was in Malta with Connor Benzey for the European Under-17 Open, remains top of the rankings by one point from Sykes. Weston and practice partner Jamie Wilson (Havant) are 13 points further back in joint third. Hughes is fifth. Ronnie Sullivan: 72, 44, 40. ROUND-ROBIN GROUP A: 1st, Steven Hughes (Chandlers Ford SC); 2nd, Elliott Weston (Top Spot, Havant); 3rd, Jamie Wilson (Waterlooville Sports Bar); 4th, Ryan Hughes (Chandlers Ford SC); 5th, Chloe White (Waterlooville Sports Bar). ROUND-ROBIN GROUP B: 1st, Oliver Sykes (Chandlers Ford SC); 2nd, Ronnie Sullivan (Frames, Coulsdon); 3rd, Riccardo Drayton (Chandlers Ford SC); 4th, Arron Smith (Selsey RBL); 5th, Mickey Joyce (Academy, Basingstoke). SEMI-FINALS (15 points): S Hughes 3-2 Sullivan, Sykes 3-2 Weston. FINAL (£100/£25, 25/18 points): Sykes 3-1 S Hughes.